Call owner Lee @ 561-964-7593. 1983 SEA OX Open Fisherman, Marine mechanic lost sea legs due to old age. 23ft Sea-Ox open fisherman with walk-around cuddy cabin. 7ft bunks, bought new and kept in dry storage, deep v-hull, fiberglass, rigged for fishing and diving. 235 Evinrude, low hours, spare SS prop, gas, 90 gal tank, kicker bracket mounted on transom, lifting eyes, and spreader bar. 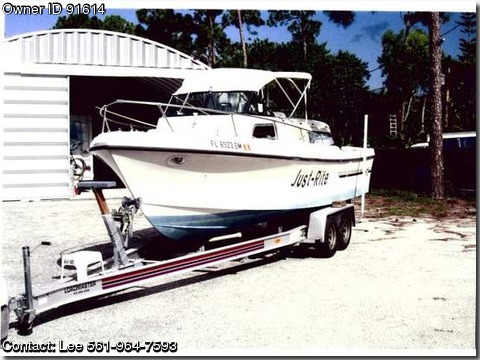 Two large fish boxes, live well, Penn down-rigger, like new Bimini top, Lee outriggers, trim-tabs, color GPS, VHS radio, fish finder, dual 12 volt batteries, two bilge pumps. On Load-Master aluminum float-on trailer with hand winch, two-spare (mounted gal. wheels) SS brakes.